A new compilation has unearthed experiments in soul music made by pop legend Bobby Darin at his final recording home. Charles Donovan talks to its compilers/producers, Joe Marchese and Andrew Skurow. The reissue industry doesn't just present us with new ways of appreciating old works, whether via straight-up CD/download remasterings (although the nature of any particular remastering is almost always a source of controversy and contention among audiophiles), sprawling deluxe and super-deluxe editions and, sometimes, all-analogue vinyl reissues (the industry standard has become digitally-sourced vinyl – not necessarily the optimal method when it comes to albums that were recorded to analogue tape). It also excavates entire albums that were canceled just before release (e.g., Dusty Springfield's Longing originally intended as a 1974 ABC Dunhill release, which eventually saw the light of day in 2001), and songs that were bumped from the final running order of classic albums (e.g. "Who Can I Be Now", which lost its place on David Bowie's Young Americans to accommodate an inferior Beatles cover). Now, a new release from Second Disc Records (an imprint of Real Gone Records) gives us the opportunity to see one particular artist in a brand new light. 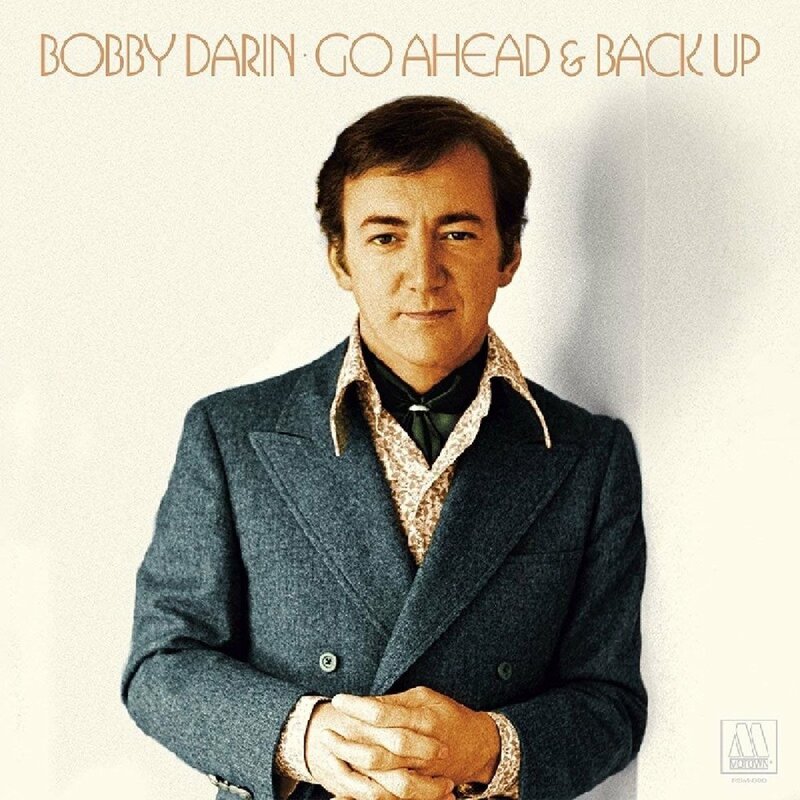 Go Ahead & Back Up: The Lost Motown Masters, a 24-track Bobby Darin collection, is the companion piece to Another Song on My Mind: The Motown Years, the two-disc collection which preceded it a couple of years ago. The difference is that while the earlier compilation focussed on the Motown material released in or shortly after Darin's lifetime, the new collection is full to burst with previously unreleased recordings the existence of which had been completely forgotten. It represents the final phase of Bobby Darin's recording career, just before a life-long heart condition felled him, and – worlds away from "Mack the Knife" – it includes recordings overseen by Motown's top writing and production talents, including Ashford & Simpson and Smokey Robinson. This is particularly significant because while Motown did issue a full album while Darin was with the label (1972's Bobby Darin), it did not have the typical Motown sound but was instead populated by singer/songwriter material, like Randy Newman's "Sail Away" and – written by British singer/songwriter Richard Kerr in tandem with Scott English – "Who Turned the World Around". Not only does the new compilation unveil numerous experiments that Darin undertook while with the company, but it also exhumes the remainder of a whole album – Go Ahead – some of which appeared on the prior compilation and which was just at the point of being prepared for release in 1971 when it got shelved. Go Ahead & Back Up is a release very close the affections of its two co-compilers and producers, Joe Marchese of the Second Disc (not only a label but also the internet's most authoritative reissue website) and Motown historian Andrew Skurow. The former wrote the absorbing and formidably well-researched liner notes, while the latter supplied scrupulously detailed track-by-track annotations. In the week that the collection hit the shelves, I spoke to them about it. You mentioned to me that this release is particularly close to your heart. Could you tell me a bit more about why that's the case? Joe: Throughout my life, two musical constants have always been the great standard songbook and the music of Motown. When I discovered that Bobby Darin, an artist in the classic tradition I'd long admired, had ended his career at Motown, I was immediately fascinated. The possibilities seemed endless. Of course, they weren't; a relatively small amount of material was released by Bobby on the label, and most of it didn't have that Motown "sound". His time there was largely overlooked even by his biographers. (I attempted to rectify that with the 2015 collection Another Song on My Mind: The Motown Years.) To discover that, yes, Bobby did record quintessential Motown music was a thrill. I took my responsibility very seriously to present the 24 tracks on Go Ahead & Back Up in the context of an incredible career, and in a way which would honor his memory. I was very lucky to be able to work alongside the best team in the business. Gordon Anderson and Gabby Castellana at Real Gone Music were with this project every step of the way. My co-producer Andrew Skurow brought his incredible passion and knowledge. John Sellards, our designer, brought his unerring eye as an artist. Kevin Reeves, our engineer, and sonic wizard, made these recordings sound better than we thought possible. Harry Weinger at Universal…the list goes on. Everybody was so supportive and contributed to make this producer's dream a reality. How long does a project like this take to come to fruition? Andrew: A project can happen in as few as three months, but it generally takes about four to six. There needs to be time to compile the project, to decide what should go on it. There's also a lot of musical exploration, determining what was recorded for a project, what fits, both musically, and within the confines of the 79 available minutes on a CD. Sometimes we determine that a song might be better for another project. Then there's the writing of liner notes, setting up interviews, selecting photos, working on the layout, and then going through the revision process. Some projects drag on for years, and during that time, we just keep refining the project. Joe: I had the first notion of this project in 2015 while producing Another Song on My Mind: The Motown Years, the two-disc collection of Bobby's released Motown recordings. All credit for that notion goes to two remarkable gentlemen: Jerry Marcellino and Smokey Robinson. Jerry was my first interview for Another Song, and he mentioned to me that Bobby had recorded a song of his called "Child of Tears" which had never been released despite what Jerry felt was clear hit potential. "Hmmm," I thought. I knew I was onto something for sure, however, when Smokey brought up two more unreleased songs during our chat: "The Devil Must Be Beating His Wife" and "Cindy". I knew "Cindy" from the Temptations' recording, but what was this "Devil"? Nobody else had ever recorded it, and I knew that, coming from a quintessential wordsmith like Smokey, that the song must have been something special. Smokey clearly remembered rehearsing with Bobby. He doubted that Bobby had ever recorded lead vocals for either track. I wanted to find out. The seeds of Go Ahead & Back Up were planted. Research began in earnest in the middle of 2016, and here we are! Am I right in thinking that although the existence of the canceled album was known about, some of the tracks on the new collection were genuinely 'lost', i.e., had been completely forgotten about and were not even known by Darin completists? Andrew: Absolutely! We had never even heard of this album floating around. In the case of Bobby's album, it was likely completely forgotten. You have to remember that none of the employees who worked at Motown from 1970-1973 work there anymore. That means that anyone who knew about it isn't necessarily bringing us that information. Joe: Along with "Child of Tears" and the two Smokey Robinson songs (for which we still weren't sure vocals were recorded), we knew of two more Motown outtakes. A version of "Go Ahead and Back Up" had circulated for years among the Darin fan community, and Tim Rice had played "I Don't Know How to Love Her" on a UK radio broadcast. A handful of other song titles had been mentioned by fans, and in various books, so we had enough evidence to begin the search. (Some of these titles proved accurate, and others not at all.) Little did we know how much we would find – including an entire album which not one of Darin's biographers or any Motown historians ever mentioned. The discovery of the original Go Ahead album, sequenced by Bobby and ready for release (there were even vinyl cutting notes! ), was thrilling in every way. Once we heard it, we were in disbelief that it had been shelved. That proved to be just the tip of the iceberg! If so, can you tell me how they all came to light? Joe: We drew upon session logs, tape cards, and tapes themselves to put this puzzle together. Each source revealed a new, different part of the story of Bobby Darin at Motown. Every new discovery was a "pinch me" moment. I still can't believe that we unearthed productions by the Corporation and Ashford and Simpson. Who knew? Does this collection represent the complete wrapping up of Bobby Darin's story as a recording artist or could there be more? Andrew: One thing we've learned is that there can always be more. You can exhaust every tape, every tape card and log reference, every single option, and then play a tape by another artist and find a vocal by someone like Bobby, not listed anywhere. We were incredibly fortunate to discover magic in nearly every tape. Joe: When it comes to Motown, I've learned never to say never! Why do you think it was that Bobby went in so many directions at Motown – did he and the company not have a clear, confident vision of where they wanted to go in terms of his recording career? Andrew: At Motown, it was always "competition breeds champions", So everyone was trying to outdo everyone else to be the very best. If a producer wanted to work with an artist, and if the artist wasn't locked in with another producer, they could. It doesn't necessarily mean the marriage would work, but sometimes it absolutely did. I think Bobby was just working with everyone, looking for the right sound. The true treasures of this collection are Bobby working with Smokey Robinson, the Corporation, and Ashford & Simpson. Joe: Throughout his career, Bobby was racing against the clock. He never knew how much time he had left, but he knew the value of time and how precious it is. He skipped from genre to genre but was no mere dilettante. He brought 110% of himself to every style in which he recorded: rock-and-roll, standards, country, folk, and finally, R&B and soul – just to name a few! Bobby was at a personal crossroads when he signed at Motown. He wanted to be his authentic self and to say something, but he also realized that the "entertainer" persona was indeed valuable and brought fans so much joy. It was also a great vehicle to get those important thoughts across. I think Motown was trying to accommodate Bobby by allowing him the freedom to explore his varied muses. I believe the song "Go Ahead and Back Up" is the story of his own realization. "We're Getting There" is an example of how he channeled his social conscience into R&B. Do you think that some people have preconceptions about Bobby Darin (and if so, what might those be?) and will be surprised and enlightened by some of the soulful performances on this collection and by the fact that he worked with people like Ashford & Simpson? Andrew: I think if you only know "Dream Lover", or "Mack the Knife", then you might be surprised. But for anyone who knows Bobby through his music, knows that he didn't want to be pigeon-holed into one genre. He could sing anything, and I think he welcomed the challenge of singing anything. Motown was just another musical space to play in. The discovery of the three standards was a surprise. Musically, they sound great! And vocally, Bobby's nailing it! We were blown away by "Rags to Riches", "Mona Lisa", and "Smile". Plus Kevin Reeves knows how to bring out the best in these tracks. He's the best engineer I've ever worked with. After listening to the individual tracks, hearing him live in the room with the musicians, I think the shots of him we know from the 1972 self-titled LP are from these sessions. [Photographer] Jim Britt may know for certain, but on the tape, he's singing with the same microphone, and he's calling the shots in the studio! Joe: Finding the vocals on "Cindy" and "The Devil" was a huge surprise. The session legends [sheets breaking down which vocal and instrumental parts are on which tracks of the multi-track tape) didn't indicate that vocals existed. Smokey Robinson didn't remember vocals existing. We put the tapes up, hit play, took a deep breath, and…there was Bobby Darin, singing silky soul written and produced by Smokey Robinson. Two of the greatest artists of all time, working together. You can hear their mutual appreciation and admiration on the duet of "Cindy". Pure magic. It gives me goosebumps every single time. The same went for the two Ashford and Simpson productions, "Oh Lord, Where Is My Baby" and "I'm Glad About It". We had no proof that Bobby had ever recorded these songs, but we played a hunch (and played the tape)… and boy, did it pay off! We were honored to present the recordings to Valerie Simpson, who was gracious enough to give us her blessing for their release. Could you tell me what some of your favorites are from among the tracks on the new compilation and why? Andrew: My favorite song on the collection is the extended mix of "Melodie". I've always loved the song, not just Bobby's, but Michael Jackson covered it, as did the Supremes and Four Tops. Joe and I heard the multi-track while listening to another song. We realized it already sounded better than the mix from 1970. Kevin Reeves and I went into the studio and began remixing it. When we heard how good the individual pieces were, we realized the song was begging for a breakdown. As soon as we started doing that, we each got goosebumps. It was like Bobby was right there in the room with us. The piano was isolated, and I realized it was basically playing "Ain't No Mountain High Enough!" we went crazy. Then Bobby scatting! You couldn't have asked for a more perfect ending to an already magical collection. Joe: Can I choose more than one? "Smile" is Bobby Darin at the height of his artistry, singing a classic standard as only he could. The sophisticated soul of "I'm Glad About It" bowls me over every time; it's the one track that really points me in the direction of where I think Bobby would have gone musically, had he lived longer. "Oh Lord Where Is My Baby" may be the most exciting, impassioned vocal on the set. "Go Ahead and Back Up" seems the purest statement of Darin as an artist and a person, and "Melodie", well, I think the new, extended mix deserves a spot on every Northern Soul playlist. It's pure electricity and is ready for the dancefloor! Go Ahead & Back Up: The Lost Motown Masters is out now on Second Disc Records/Real Gone Records.